Highway snow plow models (MSPN, MSK and KSM04) can be equipped with hydraulic additional blade mechanism LH to achieve the best plowing result. Clean road surface to the maximum – Hydraulic additional blade comprising 4 sections divides pressure between the front blade and additional blade. Each additional blade section has its own cylinder, ensuring operational pressure in the extent of the entire additional blade. 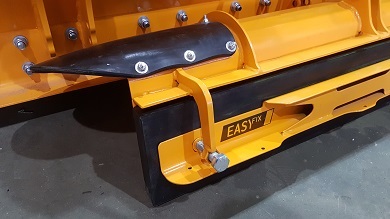 In the event of packed snow, the weight of the entire plow is transferred to the front blade; in the event of slush, weight is transferred entirely on the additional blade equipped with rubber blades. Using the right pressure in the additional blade system ensures extremely clean road surface and highly economical use of the blades. It is possible to mount also 6 section hydraulic additional blade mechanism to models MSPN3404, MSPN3704 and MSPN4004. Replacing blades in 5 – 10 minutes –The „Easy Fix system” of rubber blades (there are no fixing slots in the rubber blade) saves time when releasing and securing the bolts. This allows you to position the blade at any desired height. It takes only 5 – 10 minutes to replace or adjust the rubber blades!